MapWarper at Where2.0, with Layers! Tomorrow I’m going to be doing an Ignite talk about MapWarper, and will talk about the newest function – Layers! You can now make a mosaic of your maps. News in brief style post… I really should do these as a podcast…. 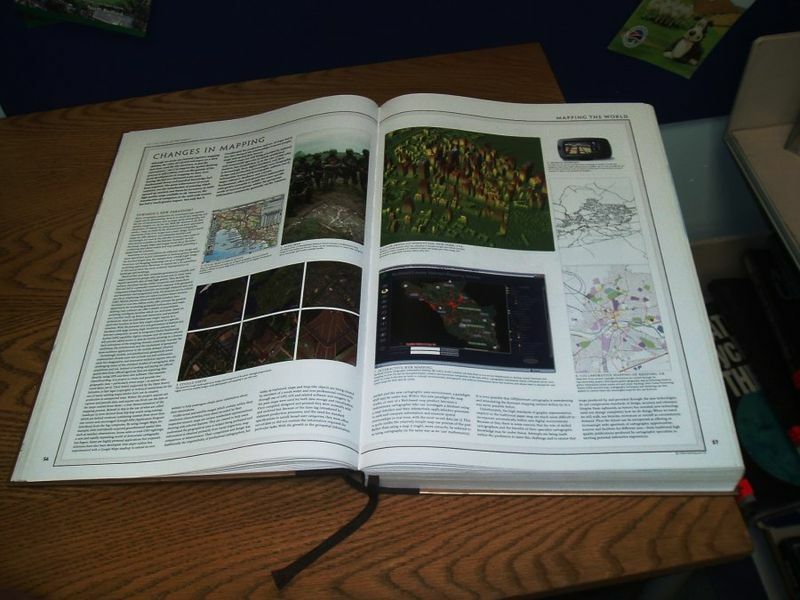 The Times Atlas, a wonderful coffee table sized book, has a section about OpenStreetMap. Nice! Google MapMaker is releasing the data made by people using their Map Maker service, only for non-commercial and private use. Could be very useful for humanitarian work. Currently for Kenya. Mikel does a great comparison of OSM vs Map Maker. Google StreetView has launched in the UK for a few areas….highlights include half the photo covered with chestnut leaves, and in Bradford, the car being pulled over by the police. Ed writes a funny post about publicity, spectacle and the press, after the story about a village chasing the G car out of their roads. So, we mocked the UK government when they said that mappers were terrorists, but as Geocarta writes, two people in India, making a map with their GPS device have been arrested for this “reason”! Apparently they were working for the GI company Biond Software, collecting data for Nokia (and Navteq?). As of writing this post, the pair will be in day 7 in police custody. Citizens alerted the authorities after seeing the GPS devices on the cars. Then, after being arrested, they were futher doomed after the police saw that they were taking pictures of gates and walls, especially around an airport which has an army base next door. A police official told TOI that more than the data, the agency is interested in knowing to what end is the data used. “A detailed map can show strategic locations or disclose sensitive information, it can be used by terrorists or people with malafide interests. Thus, we are going through the maps and also questioning them about their clients,” said the official. I’ve asked Nokia International for comment, but have yet to hear anything. Edits: Nokia India’s press office email at communications.india@nokia.com is not working (user unknown error)! 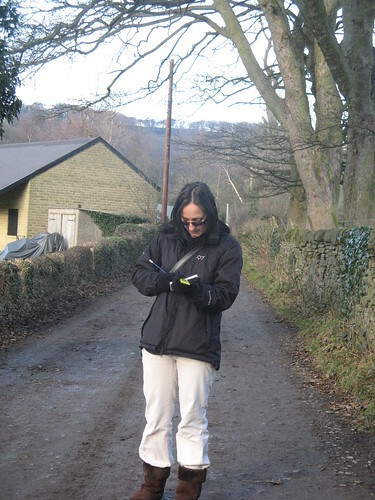 We took the train from Sheffield to Hathersage, which gave allowed some time to get used to the gps units. 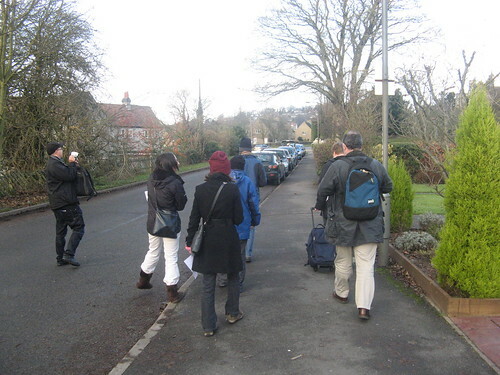 Wandering along quaint, but cold tracks, to mark those points! of course, we met up in a pub, The Little John for extremely large plates of food, and beer. How to map a city. From Bradford mapping party a few weeks ago. They had around 20 participants. Bradford, the city in West Yorkshire that is quite undermapped is having an OpenStreetMap Foundation organised mapping party! 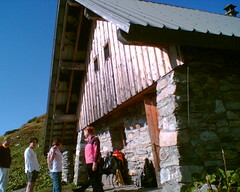 27th & 28th September, 2008. Help put this city on the map. The intention is to help build up a community of local mappers, whilst mapping as many highways, cycleways and footpaths as possible within the A6177 ringroad. There’s GPS units to borrow, full training given. Come along for a couple of hours or the whole weekend. Everyone welcome! Have fun! Heres a little online utility to help make custom j2me GpsMid midlets for your phone. 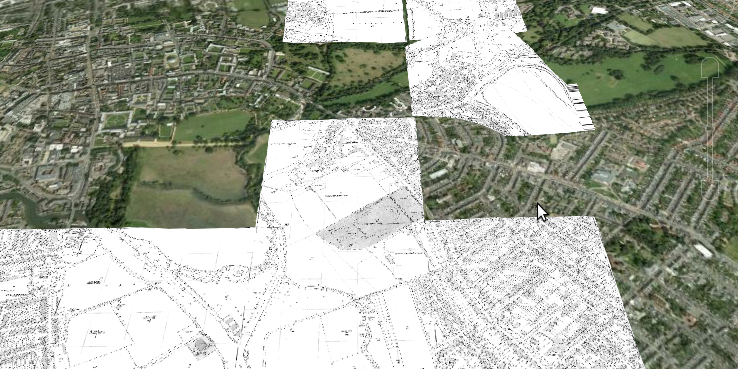 GpsMid is a vector based tracker and viewer of OpenStreetMap data, I’ve covered it some more here, it’s rather good. I like how you can search for streets and places, and it adds it as a virtual waypoint to help you navigate to that street. It also has good zooming support. For my phone Nokia 6023i, I choose the no-obex option, and turn the routing off (it’s not quite working correctly for me). The second of my Japan blog posts: A couple of weeks ago, we had a mini mapping party at Tokyo. My hosts were Hiroshi Miura from Openstreetmap.jp and the Kodeo (Little Edo) Linux User Group, a great group of people, professionals and enthusiasts. We met at the IPA (the IT Promotion Agency – a kind of governmental centre for promoting excellence in IT), near Sugamo. Hiroshi Miura, who recently has started openstreetmap.jp invited me to give a talk and demonstration about OpenStreetMap (slides) and then afterwards we walked out to map a local famous garden. Unfortunately, I may have gone on a bit, as by the time we got there, Rikugi-en Garden was closing (4:30), so instead we journeyed out to the more complex streets around probably better for giving a more representative view of osm mapping, if less pretty! 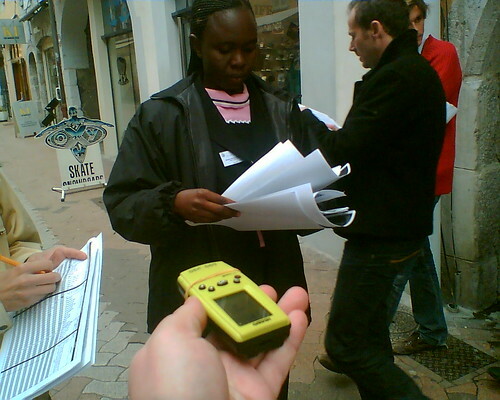 Most of the folks had GPS, after Miura-san introduced the OSM project to them earlier in the year. 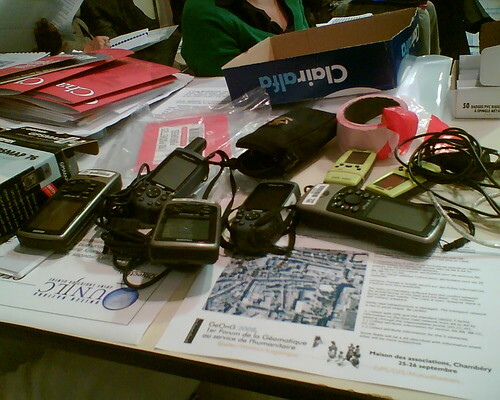 Many different types of GPS were present, a few built into phones, bluetooth, loggers, and one person even had a PSP with GPS unit (he said that the quality was quite poor, plus the only application that it can be used with, only works in Japan). 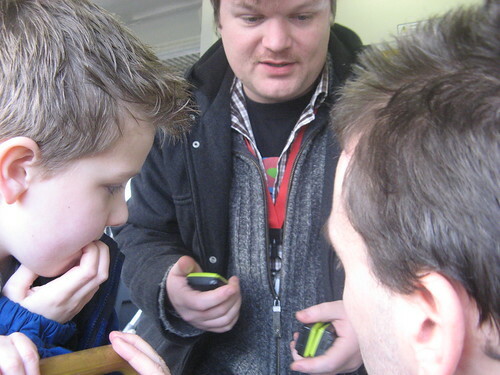 Part of the afternoon was meant to be an exploration of the various quality of GPS receivers. Road signs are different in Japan, many roads are not named – instead, the block that the road goes next to are marked, blocks of houses become the address, rather than the street the house is on. 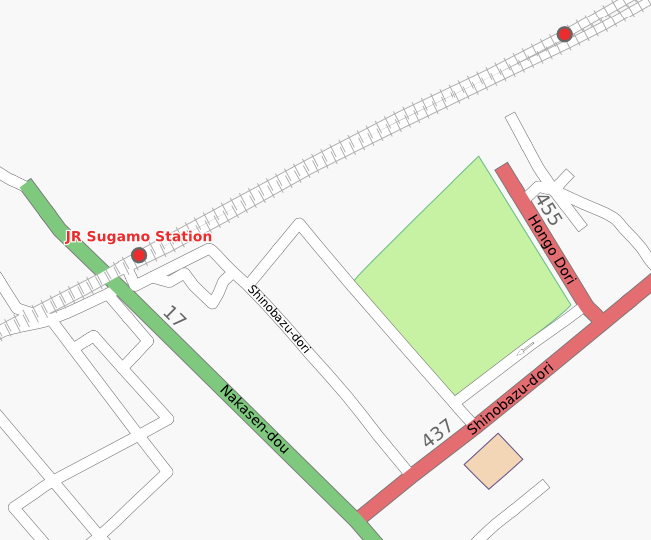 More details can be found on the wiki for mapping in japan (in english), and http://www.openstreetmap.jp (in japanese). The ward boundaries are apparently available from the government under a similar to CC-by-A licence, so work could be done to help import this into the osm database. This is “hatochan” Kentaro Hatori – the organiser of Kodeo LUG, pointing out local landmarks! In this case the very famous Anpanman, outside a childrens creche. 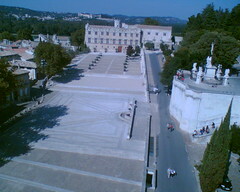 We noted many things, such as a difficult five road junction, with various types of roads. Junctions, parking, amenities, restrictions and buildings were among the things mapped. We also encountered a special form of police box a “Koban” – different from a police station (we came across one of those as well). Japan’s cities, and Tokyo is a good example are very compressed and dense – something that was mentioned a few times by those mapping- which brings certain problems and opportunities, but I’ll talk about these in my next post. 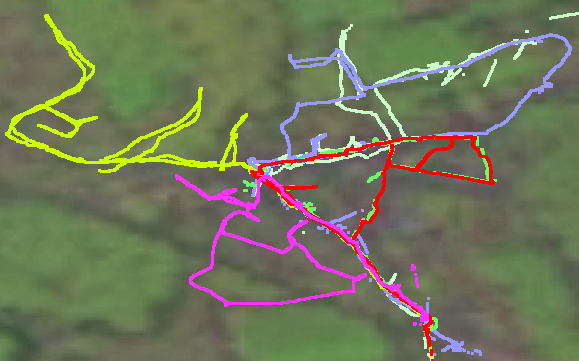 After heading back to the IPA we extracted GPX tracks, and started to do some editing using potlatch and JOSM. Then it was off to the pub. I’m pretty sure we ended up at Akasaka Gorou Hazime, for beer, shochu, dried & fresh fish & other tasty morsels. Much laughs, and cultural understandings were exchanged about the world of otaku, and things geek! I found out about bash-on-rails (apparently it works really well), and some of the activities of the LUG, including selling “attractively covered” linux mags at the huge twice yearly Tokyo Comic Market. We ended up at a famous pig back-fat ramen shop, for a bowl of oishii-delicious noodles. I think we all enjoyed ourselves! Thanks to Hiroshi and the folks at Kodeo LUG! This is a great application from Martijn (his blog) – it’s a style editor for Mapnik – one of the renderers used to render Openstreetmap data. It goes a long way to helping differentiate the map from the data, as I discussed in this post “a manifesto?“. 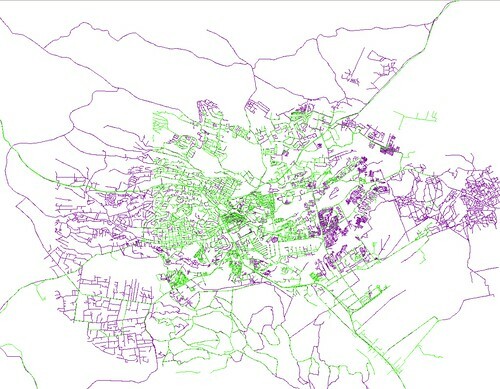 OpenStreetMap’s power is the data. It also shows the flexibility of mapnik, and the Freedom in being able to have the map you want. Have a go by selecting some of the predefined styles.